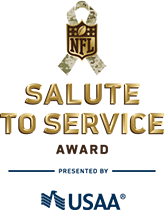 The Salute to Service Award presented by USAA acknowledges the exceptional efforts by members of the NFL community to honor and support U.S. service members, veterans and their families. Click below to learn more about the 2018 Salute to Service Award. The NFL does not profit from the sale or auction of Salute to Service - identified merchandise. Since the campaign launched, the NFL has donated more than $26 million to its military non-profit partners. Funds are raised through two primary channels: NFL Auction and the sale of Salute to Service- identified merchandise at retail. NFL Auction: 100% of proceeds from Salute to Service products auctioned on NFL Auction go directly to the NFL's military non-profit partners. At Retail: The NFL does not profit from the sale of Salute to Service products. Charitable contributions are donated to the NFL's military nonprofit partners including the USO, Wounded Warrior Project, Pat Tillman Foundation, TAPS and the Bob Woodruff Foundation.